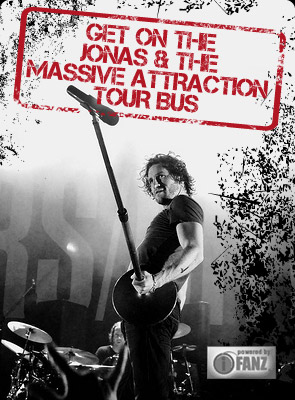 NEW JONAS & THE MASSIVE ATTRACTION DVD – “LIVE IN GERMANY AT ROCKPALAST” OUT NOVEMBER 20, 2012! Breaking news…..the new Jonas & The Massive Attraction DVD – Big Slice Tour 2012 – “Live In Germany At Rockpalast” is set for release in stores across Canada on November 20, 2012! See the first ever quality LIVE concert footage of the Big Slice Tour, as the band makes their first steps in Europe and tears it up in front of a live audience at the Harmonie club in Bonn, Germany, for the legendary German TV show Rockpalast (U2, Coldplay, Deep Purple). “Live In Germany At Rockpalast” showcases Jonas & The Massive Attraction performing their hits “Big Slice”, “Seize The Day”, “Here She Comes”, “Edge Of Seventeen” and their new Top 15 single “The Deep End”, as well as fan favourites like “What Type O Ride Are You” and “Something Beautiful”. The NEW DVD features a brand new rocker “The Anchor” and some SPECIAL BONUS FEATURES for fans, including “never before seen” interview footage with Jonas & Corey, a live acoustic performance of “Exit Wound” and the official “Seize The Day” Video!